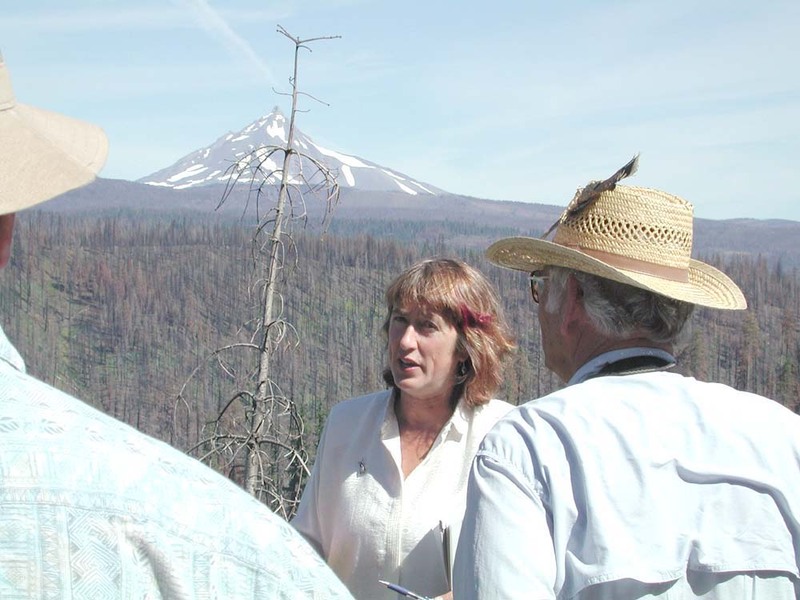 As part of the NEPA scoping process, two public outreach tours of the B&B burn were planned and hosted by the Sisters Ranger District of the Deschutes National Forest. The first tour took place on Saturday, August 14, 2004, and the second tour took place on Wednesday, August 18, 2004. 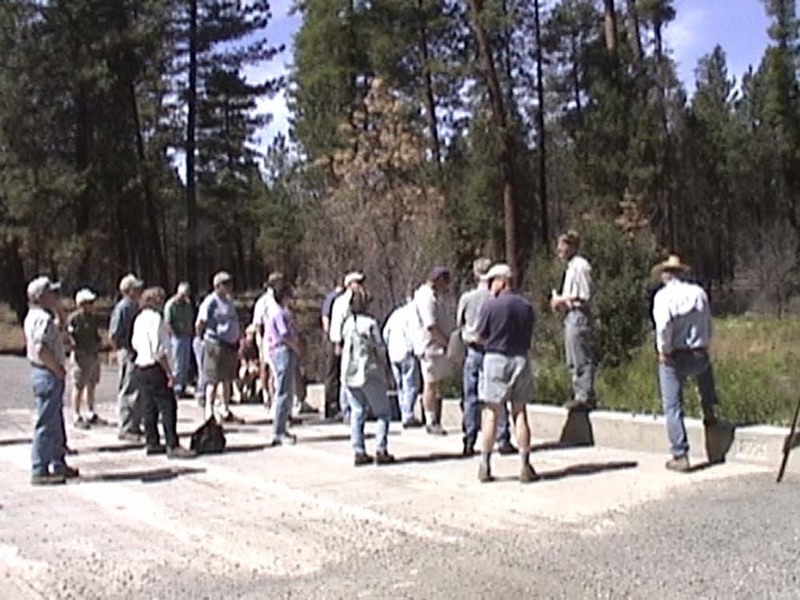 Both tours took three hours, included three stops, and began and ended at Black Butte High School in Camp Sherman. 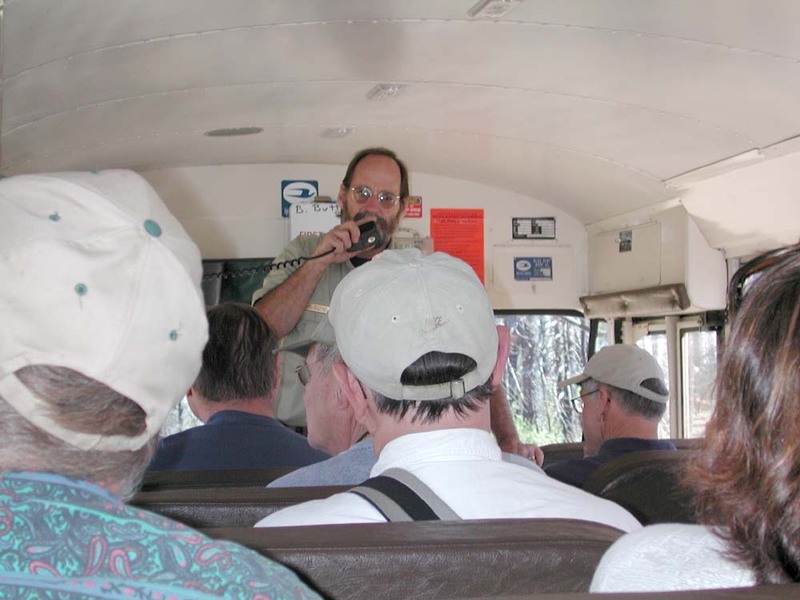 A number of materials, including forms, maps, and handouts were used in these tours. Many of these materials exist in a digital format and will be made available as copies are received. Kirk. Fire and Fuels Specialist, Sisters RD. Bob Florez. Silviculturist, Sisters RD. Tom Mafera. B&B Fire Recovery Team Leader, Sisters RD. Maret Pajutee. 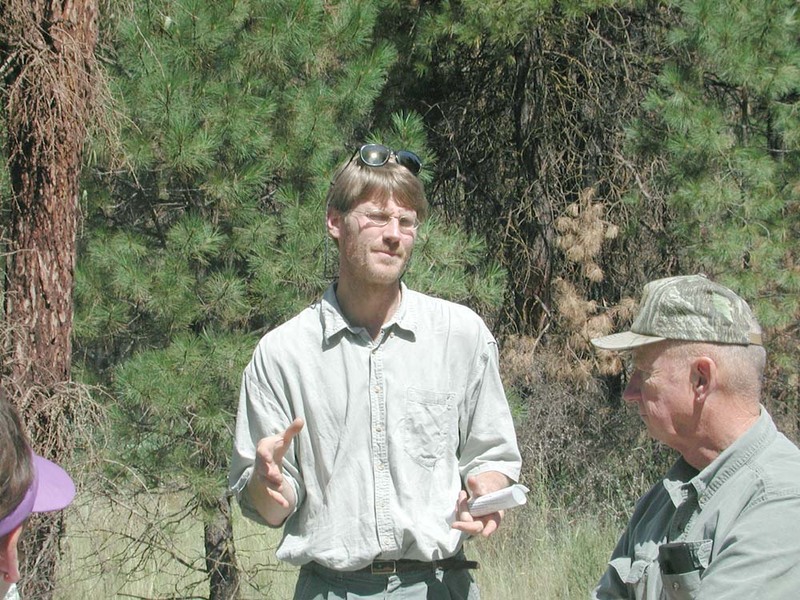 Ecologist and Metolius Basin Management Plan Team Leader. August 14. About 20 members of the public attended, nearly all retired couples. Most were present for a national RV convention in Redmond and belonged to the same Oregon club, based in the Willamette Valley along the I-5 corridor. August 18. About 30 members of the public attended, mostly middle aged or retired couples. 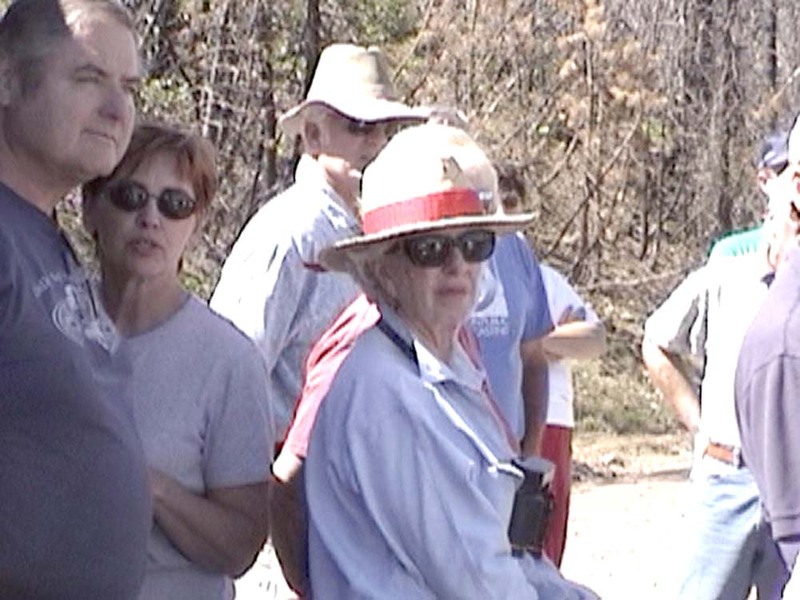 More than half of the participants were from Camp Sherman or the immediate vicinity. Getting Started on the Tour (10.9 mb). 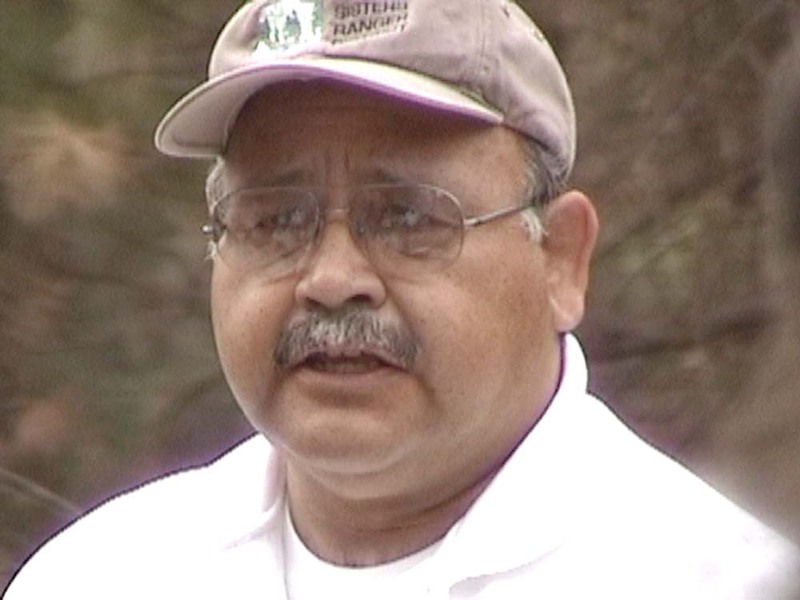 Bob Florez explains the snag harvesting sales plan and hazard trees. B&B Fire Event History (11.6 mb). 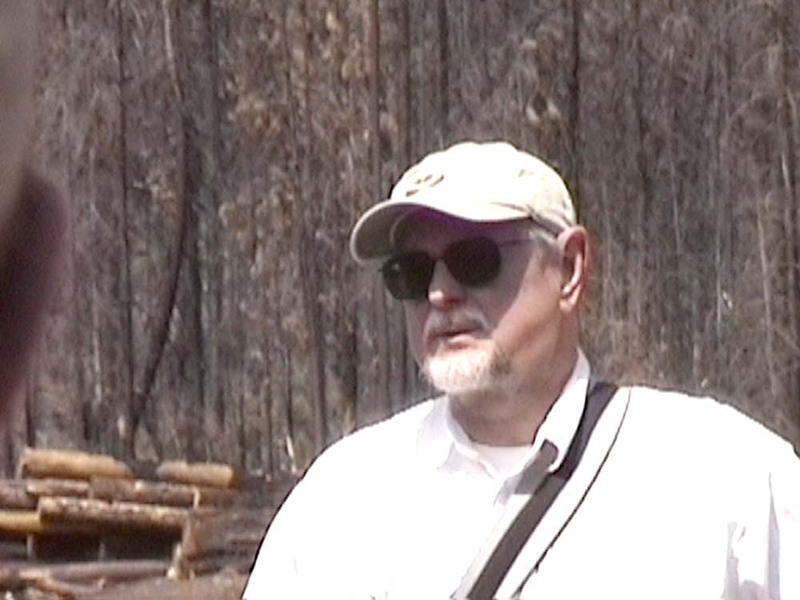 Kirk describes the details and costs ($38 million) of fighting the B&B fires. Friday 13, August, 2004 Lightning Strikes (4.9 mb). Kirk and Tom describe the 125 lightning strikes from the previous day, and how they are monitored from Black Butte lookout. 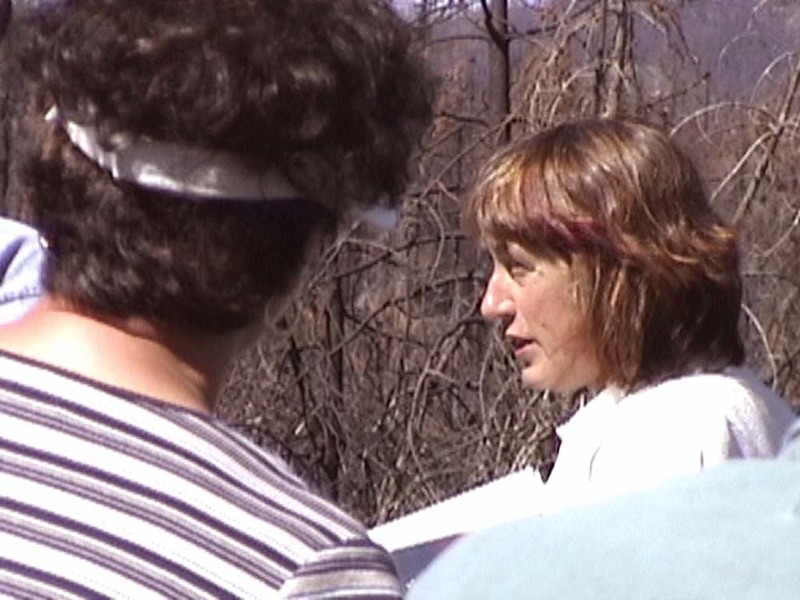 Landscape Fire History (14.9 mb) Kirk gives a recent history of large fires across the landscape of Round Lake, Square lake, Three Fingered Jack, Mount Jefferson, and Bald Peter. Local Rainfall Levels (4.5 mb). Maret describes the radical differences in rainfall between the western and eastern boundaries of the B&B. 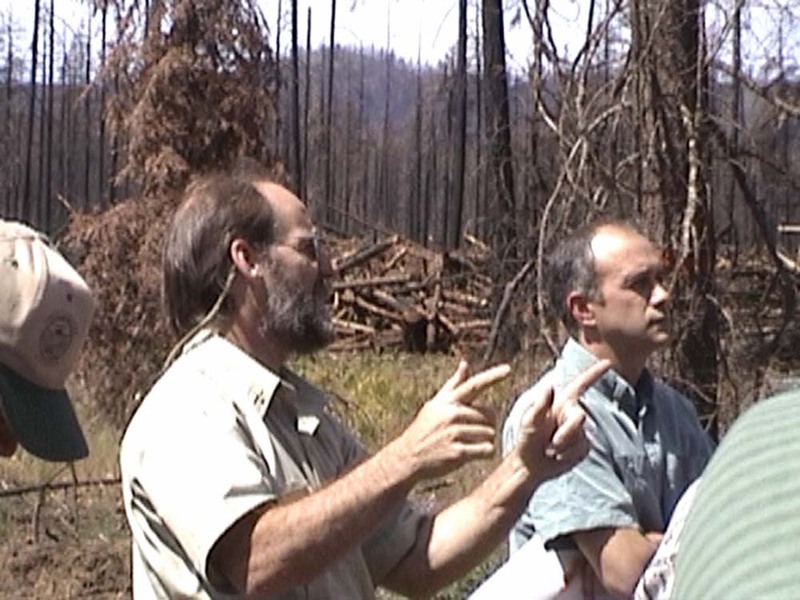 Recovery Plan Vision (8.0 mb) Tom describes the vision of the Fire Recovery Plan, with an emphasis on 10,000 to 14,000 acres of proposed salvage logging. Stop #2 Panorama (5.5 mb). 360-degree panorama of Brush Creek Bridge stop. Brush Creek BAER Bridge (9.8 mb). 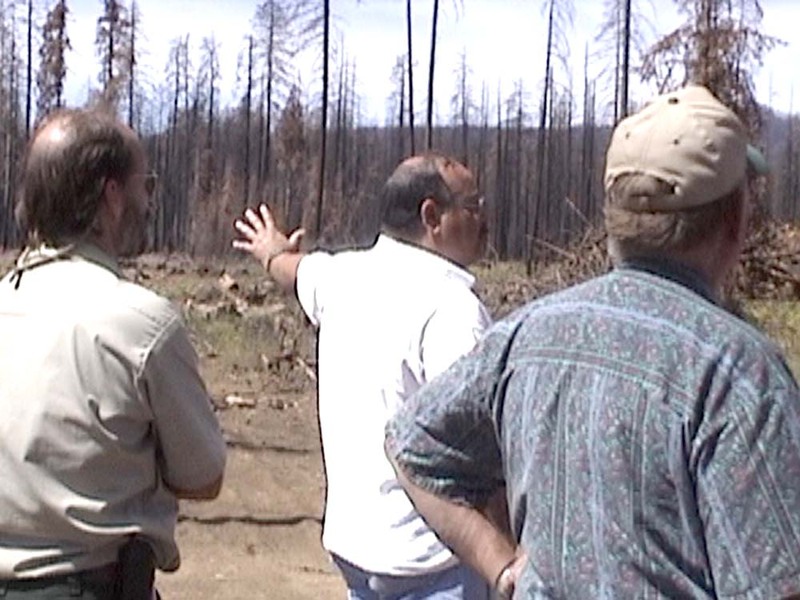 Tom and Bob discuss the BAER bridge that was constructed following the B&B fire. Wildflowers (7.3 mb). There were many species of wildflowers and native grasses within a few feet of the road and bridge. Public Outreach (6.0 mb). Participants express their thoughts and view results of BAER actions that were taken after the B&B fires. Brush Creek BAER Culvert (13.0 mb). 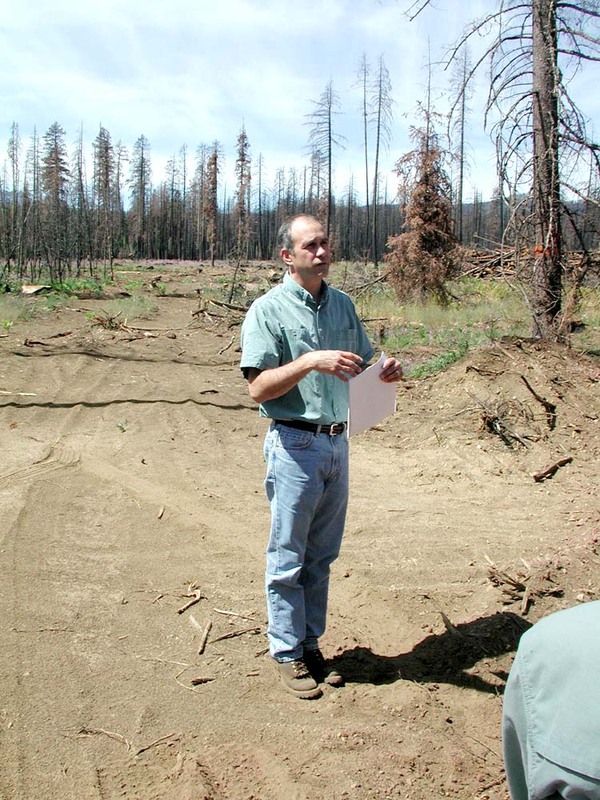 Peter explains why culverts were replaced with bridges following the B&B fires. Stop #3 Panorama (6.3 mb). 360 degree panorama of the snag thinning comparisons. Aesthetics: Snag Thinning Comparison (11.2 mb). Maret and Tom discuss the differences in aesthetics between areas, where the snags have been thinned out and the areas where the snags have been left standing. Snag Thinning Comparison, cont. (13.4 mb). Bob and Maret continue the discussion about different snag management strategies. Wildfire Risk (10.1 mb). 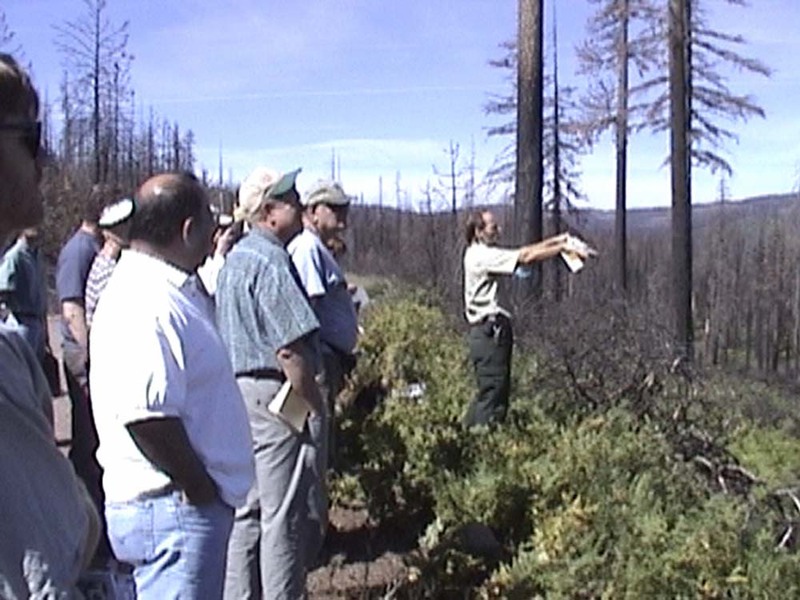 Kirk presents the risks of wildfire and discusses the differences in fire patterns between thinned vs. unthinned stands of lodgepole pine. Public Feedback (5.9 mb). 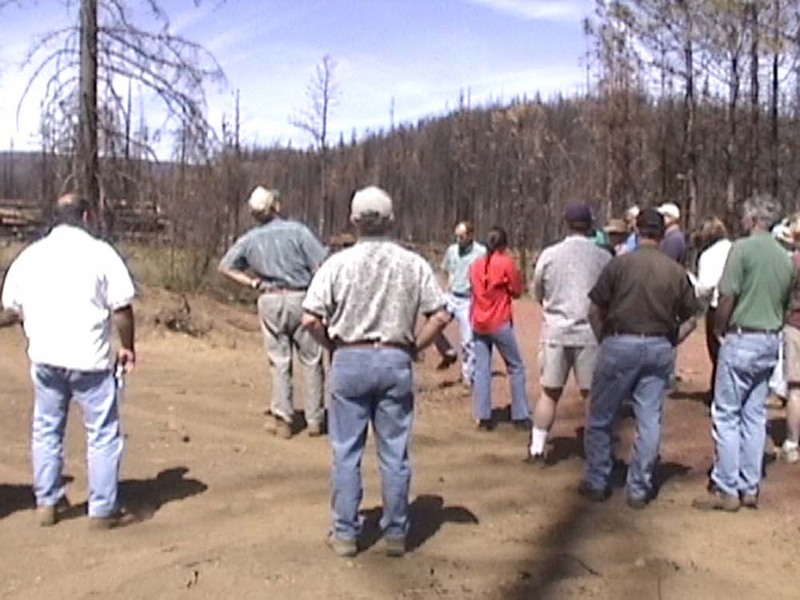 Members of the public discuss Forest Service credibility, aesthetics, and reintroduction of prescribed fire.